If one whiff of smoke from an arsonist’s fire made you see into a killer’s mind, would you consider it a gift or a curse? For CFBI Agent Jasmine McLellan, her special gift gives her an ‘edge’ as she leads a covert team of psychic government agents in search of some of North America ’s most ruthless criminals. Vicious murders, deadly secrets, suspects with hidden agendas and a dead girl’s ghost in Jasi’s closet are the key elements to Divine Intervention, book 1 in a paranormal suspense series set slightly in the future, and a novel for fans of J. D. Robb and Kay Hooper or TV’s CSI , Ghost Whisperer and Medium. It always began with the dead girl in her closet. Every night when little Jasmine opened that closet door she expected to see lovely dresses and hangers―not a child her age strung up by a pink skipping rope, her body dangling above the floor…unmoving. The dead girl had long blond hair. Her blue eyes stared blindly and were surrounded by large black circles. Her mouth hung open in a soundless scream. The pink rope was tied tightly around her neck, a thick pink necklace of death. A purplish-black bruise was visible and ugly. The most unusual thing about the girl, other than the fact that she was swinging from a rope in Jasmine's closet, was that her skin and clothing were scorched. Gagging, little Jasmine stepped back in horror. When the girl's lifeless body swayed gently from a sudden breeze Jasmine let loose a cry of terror and raced down the stairs, searching anxiously for her parents. Her throat was constricted and dry. Then she screamed. "Mommy, I need you! Help me!" In the lower hallway, the shadows quickly surrounded her. Red eyes flashing angrily at the end of the hall. 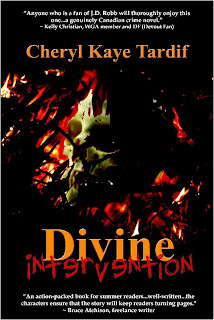 You can have your favorite bookstore order you a copy of Divine Intervention, or order from online retailers such as Amazon or Chapters. Whale Song - "mystical and poignant"